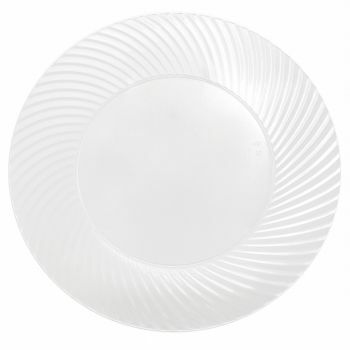 Product: 23cm/9" Clear Strong Disposable Plastic Plates with Swirl Design – Pack of 10 was added to cart. A best-seller, Mashers 9” Clear Plastic Swirl Disposable Side Plates offer all the practicalities of disposable tableware, without compromising on design. Made from tough glass-effect plastic, they measure approximately 9-inches in diameter, and they have a stylish swirl design that gives them a real designer feel. The sophisticated choice for engagement parties, weddings, buffets, banquets, and festive celebrations, these clear plastic disposable side plates will complement every venue and any table setting. Coordinate with the matching disposable dinner plates and bowls in the Mashers Swirl Collection.